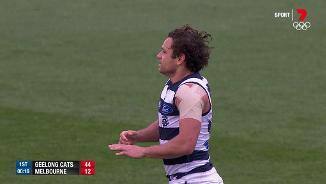 Geelong with a massive win against a disappointing Melbourne today. The Cats were ruthless at the contest winning the contested possessions 162126, clearances 41-31 and tackles 72-65. Patrick Dangerfield was again terrific for the Cats with 16 inside 50 entries (the most by any player this season), 6 goal assists (equal to the most by any player this season), and gamehigh contested possessions (17), and clearances (10). The Cats make it 10 goals in the final quarter, and easily their most productive quarter of the season. 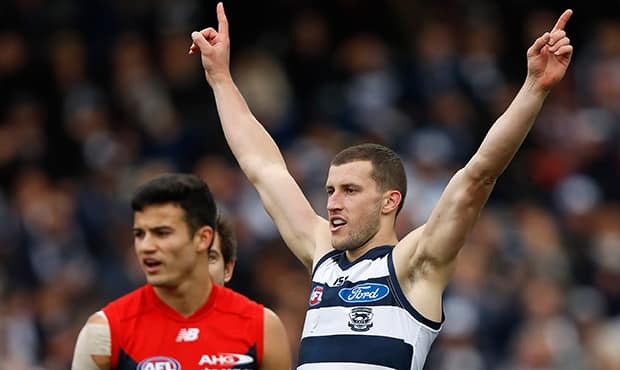 Geelong lead in forward 50 entries 5843, but has a massive advantage in forward 50 marks of 20-6 as it has easily moved through the Melbourne defence. Harry Taylor leads all players for intercept possessions with 11, which includes six intercept marks. These both equal his season best returns. Geelong has now scored 10.3. (63) from its 29 forward half intercepts. It has only scored more from forward half intercepts this season in the round 6 win over Gold Coast when it scored 67 points. Melbourne still has no goals from this source. The wheels falling off for the Demons in the final quarter, with the Cats scoring six goals from just nine forward 50 entries in this quarter. The AFL average is a goal from 20 percent of inside 50s. Patrick Dangerfield now has 15 inside 50 entries today, which is the most by any player in a game this season. Geelong has generated 26 forward half intercepts and scored 7.3. (45) from these intercepts. Melbourne has generated 20 forward half intercepts and scored 0.3. (3) from these intercepts. 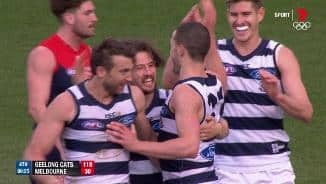 After going more than two quarters without a goal, Garlett ends the Demon drought, and breaks a streak of seven goals to the Cats. Patrick Dangerfield now has five goal assists for the Cats. Only Jack Steven with six against Carlton in round 12, has had more in a game this season. The top five players on the ground for contested possessions are all Cats, whilst the Demons still have six players yet to apply a tackle. The Cats have won all 12 games this season when they have won the contested possession count by 10 or more. They currently lead this count by 31 and are headed for a big victory. Whilst the Demons were more competitive in general play during the third quarter (both teams had 12 forward 50 entries), the Cats still won the quarter by three goals, due to an advantage in kicking efficiency of 71 to 59 percent. The Demons have not scored a goal since Angus Brayshaw kicked the opening goal of the second quarter less than two minutes into that quarter. Geelong has kicked the last six goals. Joel Selwood producing another prolific game for the Cats, has a gamehigh 25 disposals, with seven score involvements and five clearances. Geelong is the number one ranked team this season for contested marks (13.6 per game). The Cats have been strong in this area again today and currently lead in contested marks 154. Cats InterchangeJake Kolodjashnij and is possibly out for the game. The better ball use of the Cats in this match is shown by their return of 3.0. (18) from five inside 50 entries this quarter, compared to the Demons who have returned 0.3. (3) from their five forward 50 entries. Geelong now has kicked the last six goals in the game, and it is getting ugly for Melbourne who is yet to have an effective kick in the third quarter. The third quarter starts in the same manner as the first half, with a clearance to the Cats, an inside 50 from Dangerfield and another forward 50 mark for the Cats (their 10th). Geelong also leads in contested marks 94. Geelong has pressured Melbourne into error, with the Demons registering 18 clanger kicks in the opening half (they average 20 per game). The Cats have already scored 8.2. (50) from turnovers, and average 58 points per game from this source. Geelong lead inside 50 entries 3321, but more importantly lead forward 50 marks (9-2), forward 50 kicking efficiency (61 to 36 percent) and forward 50 tackles (10-2). A super first half from the Cats who have obliterated the Demons at the contest, leading contested possessions (8259), clearances (24-13) and tackles (46-30). On the back of Max Gawn, the Demons have only lost the count for hitouts to advantage in four games this season. They currently trail 47, with this assisting the Cats to lead 24-13 in clearances. Geelong now has the last 11 inside 50 entries, and the last seven scores in the game for a return of 3.4.(22). Patrick Dangerfield leads all players for contested possessions (7), clearances (5), metres gained (440), inside 50s (9), score involvements (6) and score assists (4). Geelong has now generated the last six inside 50 entries, but scored only 1.3. (9) from this period of control. Tom McDonald had his hands full with the Tom Hawkins in the opening quarter, but currently leads all Demons for contested possessions (6), intercept possessions (8), metres gained (222) and disposals (12). In the opening quarter, the Demons attempted 20 tackles and applied just 11. In the second quarter they have already attempted 17 tackles and applied 13, with this defensive improvement making it harder for Geelong to score. Melbourne has generated six of the first seven forward 50 entries to start the second quarter, in an improved performance. Melbourne has won the last six clearances in the game, with the last clearance leading to the Brayshaw goal. The Demons actually lead in scores from stoppages 2.0. (12) to 1.2. 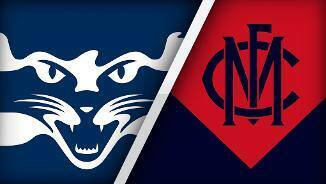 (8), with the Cats punishing the Melbourne turnovers. 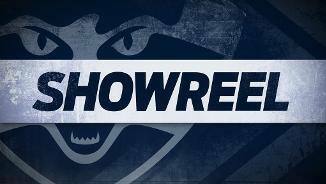 Cats InterchangeJoel Selwood off due to an injury. A powerful first quarter from the Cats, who have produced their highest scoring quarter of the season. Geelong has dominated at the contest leading both contested possessions (3727) and tackles (19-11). Demons InterchangeNathan Jones off due to an injury. Geelong has now scored 3.0. (18) from seven forward half intercepts. This season, the Cats have averaged 31 points per game (ranked 5th) from 25 such intercepts (ranked 4th). The Cats lead both the contested possession count (2817) and the tackle count (12-7). They have not lost any of the nine game this season when they have won both of these counts. Geelong has taken four marks inside its forward 50 that have all lead to accurate set shots at goal. The Cats average 15 forward 50 marks per game (ranked first), but are ranked 15th for accuracy from set shots at goal. Melbourne able to score its second goal of the game from a chain that started in the defensive 50. The Demons have generated 22 percent of their scores this season from such chains, which is the highest percentage of any team. The opening four goals in this game all going the way of the team that has won the centre bounce clearance. The Cats have also generated three forward half intercepts and scored two goals from these. Melbourne scores its opening goal of the game from a centre bounce clearance. The Demons average 11 points per game from this source (ranked 10th). A terrific start for the Cats with a goal from a forward half intercept, followed by a goal from the next centre bounce. Geelong averages 14.8 points per game from centre bounce clearances (ranked first). The Cats win the opening clearance from the centre bounce to start the game through Dangerfield. Only team mate Joel Selwood has won more centre bounce clearances this season. Both teams have been strong at stoppages this season. The Cats are ranked fourth in both clearance differential and scores from stoppages. Melbourne is ranked third for clearance differential. Two teams with contrasting ball movement styles here. Geelong has gone slow, with the lowest rate for playing on following a mark. Melbourne has played fast, with the highest rate for playing on following a mark and the lowest kickto-handball ratio. The Cats are ranked first for time in forward half differential, with their success at centre bounces contributing to this. Geelong has won a centre clearance from 49 percent of centre bounces this season (the highest percentage recorded by any side). Melbourne finished with 17 fewer clearances than the Blues last week, which is its worst differential in any game this season. Welcome to Simonds Stadium for the Geelong Cats v Melbourne Round 23 clash. GEELONG has secured the double chance in emphatic fashion, thrashing Melbourne by 111 points at Simonds Stadium on Saturday afternoon. An eight-goal opening quarter from the Cats set up the win that guarantees them a spot in the top two heading into the finals. They eventually kicked 24.11 (155) to Melbourne's 6.8 (44), after a 10-goal last quarter, which ensures the Cats will player their first two finals in Victoria. The Demons' loss was outgoing coach Paul Roos' biggest defeat in his coaching career. 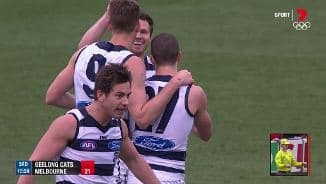 It is the eighth season since 2007 the Cats have finished in the top four but they have won just one final in six attempts since the 2011 premiership. Cats supporters had plenty of time to think about what lay ahead as Geelong dismantled the Demons from start to finish. Tom Hawkins had four goals on the board at quarter-time while Patrick Dangerfield set the scene winning the first two centre clearances, breaking tackles, running the lines and creating four inside 50s. In the process, Dangerfield broke Brisbane Lions Brownlow medallist Jason Akermanis' AFL record for inside 50s in a season and looks a near certainty to win this year's medal. It was also Geelong's first eight-goal quarter since the second quarter of its game against Melbourne in round 17, 2014. 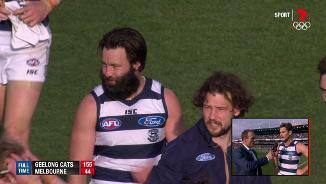 Scott was rapt with the Cats' start, particularly their work around the ball. "We were pleased with the way we were able to defend them and it always helps when you are dominant around the ball early," Scott said. "It was no mean feat for us to get on top of them early." It was a disappointing end to Roos' successful three-year stint at the Demons, with Melbourne out of the hunt so early. 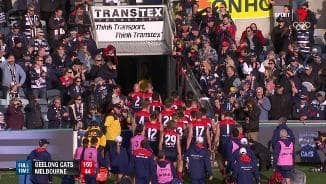 After kicking two goals in the first 10 minutes, the Demons did not kick a goal between the two-minute mark of the second quarter and the six-minute of the final quarter. Melbourne could not withstand Geelong's pressure and made 18 clanger kicks in the first half (it had averaged 20 for the season). Christian Petracca battled hard and Jayden Hunt showed dash but it appeared as though the Demons had the end of the season on their mind rather than a win to give them impetus heading into the pre-season. "It's just disappointing for the players after such a good season. There weren't many signs during the week," Roos said. "I think I've mentioned the last two or three weeks we were always looking for little cracks that might be opening up in a group that's pretty young. Today cracks opened up and turned into the Grand Canyon and they all fell in a hole together." 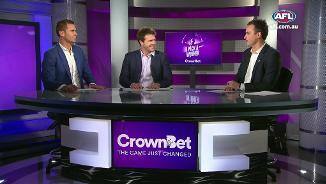 However, the foundations have been laid for a new era under Roos' successor Simon Goodwin. Geelong appears well set for a tilt at the premiership with selection dilemmas its biggest headache. 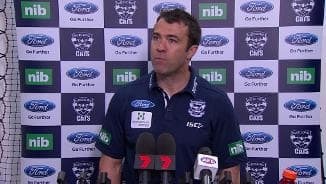 Their only concern from the game against Melbourne was a calf injury to young defender Jake Kolodjashnij, which saw him sit out the final quarter. Nakia Cockatoo will return from a knee injury via the VFL and could play in the first week of the VFL finals in the bye round. Defender Lachie Henderson will also be hoping to be fit for the first final, which could be on a Friday night. Geelong: Jake Kolodjashnij suffered a corked calf and sat out the last quarter but Scott said it was a precaution. Andrew Mackie spent time on the bench late because of hamstring tightness while Jed Bews had a niggle in the adductor but Scott said both would be fine. Lachie Henderson faces a race against time to play in week one of the finals while Nakia Cockatoo may play in the VFL next week as he recovers from a knee injury. Scott Selwood was not risked due to hamstring tightness. 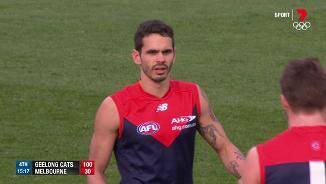 Melbourne: Nathan Jones appeared to complain of hamstring tightness late in the first quarter. Geelong's most likely opponent is Hawthorn. If the Hawks beat Collingwood they will finish third and more than likely take on the Cats in a possible Friday night blockbuster at the MCG. If Hawthorn loses then the Cats could play Greater Western Sydney if it defeats North Melbourne on Saturday night. Of course, that is dependent on the Sydney Swans winning, otherwise the Cats could finish on top, which opens up a myriad of possibilities that include West Coast and Adelaide. It's fair to say Geelong's opposition analysts will have a busy weekend. Melbourne's VFL team, the Casey Scorpions, is still playing finals but the Demons finish the season on 10 wins.